"Our sympathy and antipathy works on the etheric body. We can easily see this through ordinary observation. We know that the etheric body rules the glands. When, for example, a gourmand sees tasty food, the saliva glands become active and the 'mouth waters'. To the extent that we learn to master ourselves and balance our sympathy and antipathy, the glands in our body will dry out and become like the bark of a tree that protects what is within. In plants, the juices flow up and down. For this reason they cannot withstand the cold of winter; they die. Trees, on the other hand, allow the outside to dry up and become bark, thereby protecting themselves from the drastic effects of storm and cold. It is the same with initiates. Their life body does not die from one incarnation to another. Thus were the Druids. And 'druid' means 'oak', which is the strongest of the trees. " 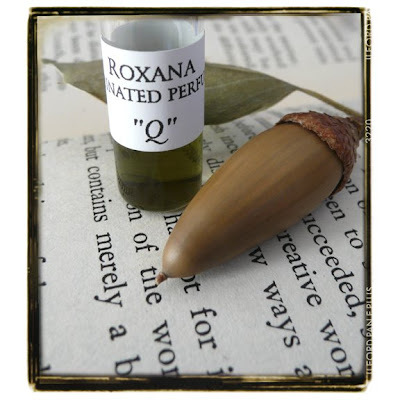 The image above is of our perfume devoted to the California Coastal Live Oak. Samples, one gram vials and the quarter ounce flacons are available at my satelite store at Etsy. Read more about Q here at the journal and on our website.